You can also see some regular UK Blues festivals listed here and venues listed here. 28-30th – Maryport Blues Festival, Cumbria. British Blues Exhibition display at Cranleigh Arts Centre, Surrey. 7th-9th – Beer R & B festival, Devon. 19-21st – Old Bush Blues Festival, Worcestershire. 15th-17th – Upton Blues Festival, Worcestershire. 16-19th – Blues on the Farm, West Sussex. 12th – British Blues Exhibition Live music night 2 ‘Transatlantic Blues’, feat. Laura Holland, Sister Cookie, and the Right Reverend Swifty LeZarre – tickets here. 16th-17th – HRH Blues, Sheffield, Yorkshire. 19th-21st – Broadstairs Blues Bash, Kent – 2015 interview with Nigel, co-organiser, here. 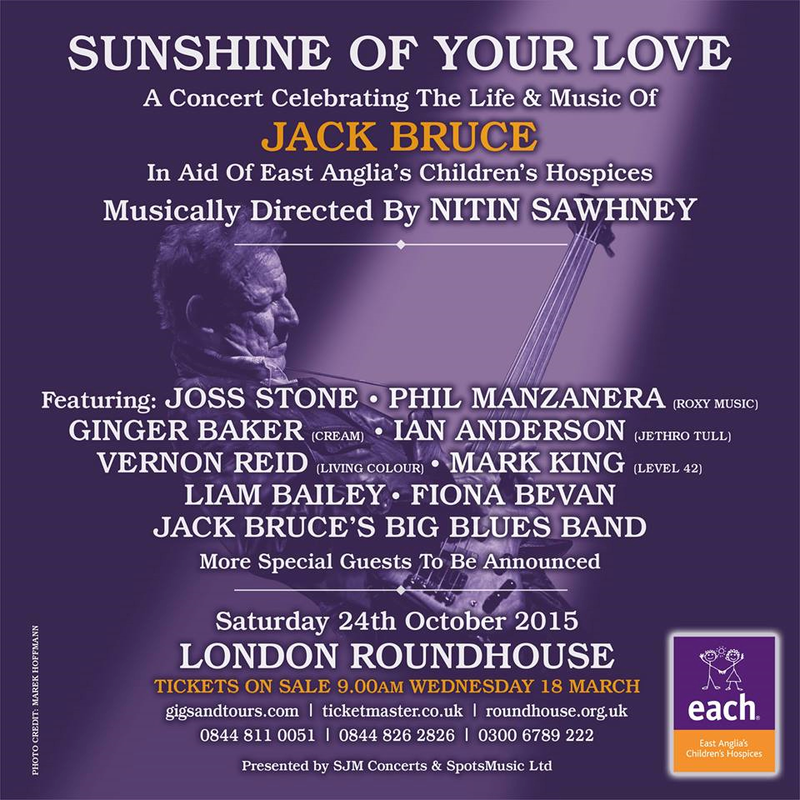 24th – ‘Sunshine Of Your Love’, a special tribute concert celebrating the life and music of Jack Bruce at London Roundhouse in aid of Jack’s favourite charity, East Anglia’s Children’s Hospices (EACH). The event, which takes place one year after Jack’s passing, will be musically directed by Nitin Sawhney and feature a host of special guests including Ginger Baker, Joss Stone, Ian Anderson, Phil Manzanera, Vernon Reid, Mark King, Liam Bailey, Fiona Bevan and Jack Bruce’s Big Blues Band. 26th – A Celebration of Women in Blues: A Tribute to Jo Ann Kelly – at The Ship Theatre, Sevenoaks, Kent. The travelling ‘Suitcase’ version of the British Blues Exhibition will be present. 3rd – The British Blues Exhibition’s Briefcase Full of Blues display appears at the Boisdale Canary Wharf in London on a night when Mike Vernon and the Mighty Combo are playing. The Patron of Music at the venue is Jools Holland. Story here. 30th-31st – The British Blues Exhibition appears for two days at The British Stage at the Great British R & B Festival in Colne. Story here. 24th-26th – White Cliffs Blues Festival, Dover, Kent. Details here. 4th – Wrinkly Rockers Club BluesRockFest 2015 in Gravesend, Kent, featuring Chantel McGregor. Details here. Story here. 1st – A Special Tribute To BB King, with Ben Waters, Bill Wyman, Elliott Randall & Friends. The Strand Pizza Express, London. Details here. 27th –Debut ‘Suitcase’ version of the British Blues Exhibition (2-5pm) at the Sevenoaks Summer Festival in Kent with Katie Bradley, herself a noted British Blues harmonica player and vocalist, and the talented Dave Ferra. The venue is The Anchor. The exhibition’s content will be leaning towards the women of British Blues. More on Facebook here.